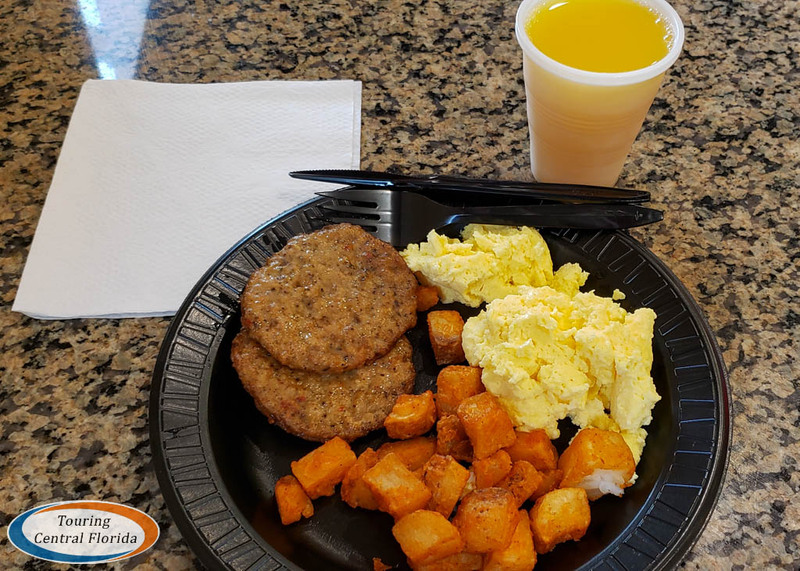 On a recent quick getaway to visit the Disney parks, we decided to try a new hotel, and chose Drury Inn & Suites Orlando on I-Drive between SeaWorld and Universal. 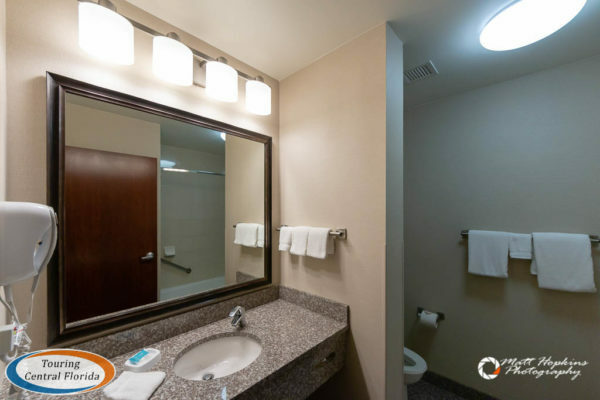 The 238 room hotel is a smoke-free property and has both standard rooms and suites available. Rates of course will vary depending on the date and how you book. 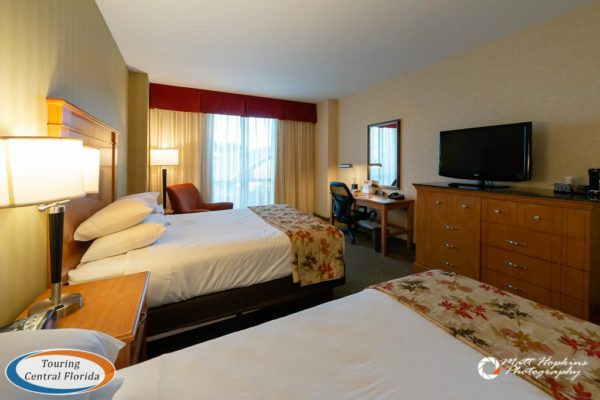 We recently stayed for two weeknights before spring break season and were able to find a prepaid, non-refundable rate through a third party website for just under $100 per night, taxes included. It’s important before sharing our thoughts on our stay what our expectations were to start. For most of our trips – this one included – we’re really just looking for a clean, comfortable, secure place to sleep at night. 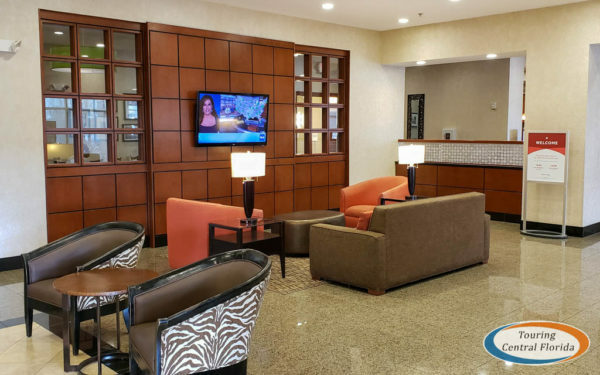 Additional amenities like free parking, free wi-fi and free breakfast are also important to us. We generally don’t use the pool, exercise room, etc. when staying at a hotel, so those options are less important. In the room, we want it to be quiet – minimal noise from outside, other rooms, the hallway, etc. 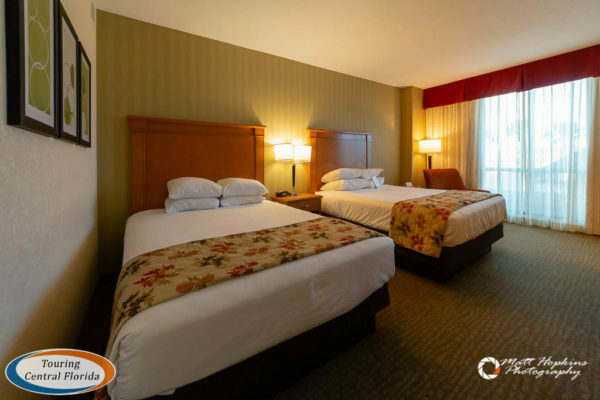 We booked a standard room with two queen beds, and were impressed with its simple decor, cleanliness and upkeep when we checked in. The beds were comfortable, each with four fluffy pillows. Each room has a digital thermostat, and the air ran quietly during our stay. 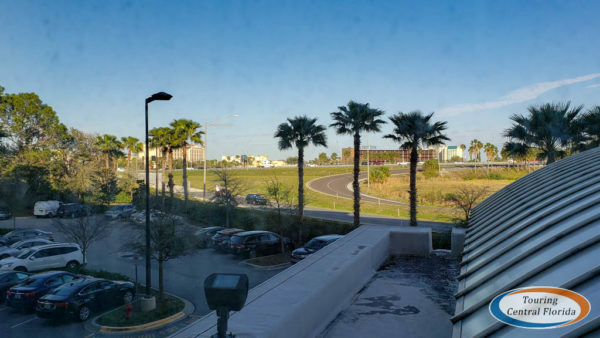 We were given a second floor room overlooking the entrance of the hotel and Interstate 4. We heard very little traffic noise. Not the most beautiful view, but we didn’t book the hotel for that. 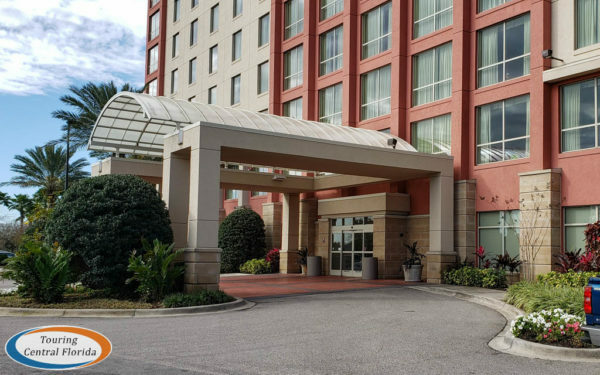 However, most of these east facing rooms, especially on the top few floors, should have a pretty good view of the ICON Orlando observation wheel and StarFlyer nearby. The room featured a chair, desk, dresser with drawers, luggage stand, and a closet with full length mirror, iron and ironing board. 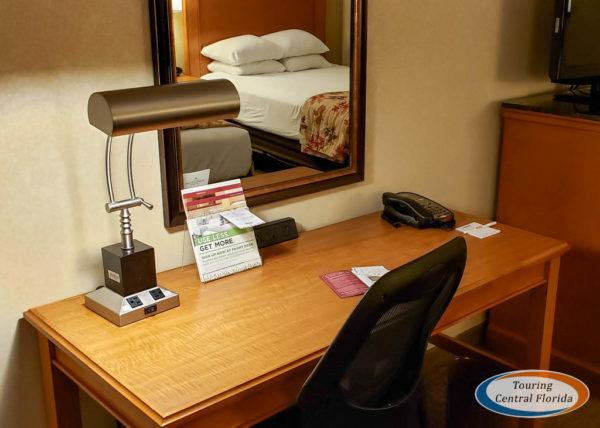 In room amenities include a mini-fridge, small microwave and individual serve coffee maker. 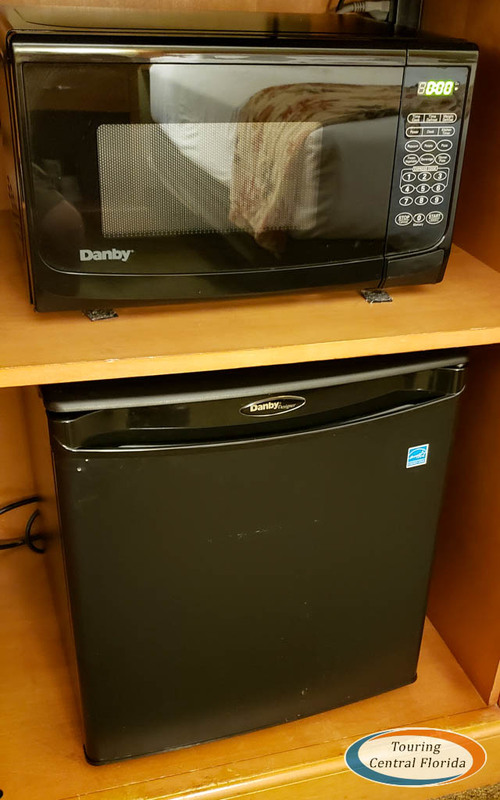 We didn’t use the microwave, but the mini-fridge kept our beverages very cold and the coffee maker worked just fine. Didn’t really use the television for more than a few minutes to check the local weather forecast, but the picture was clear and there are a variety of channels available. 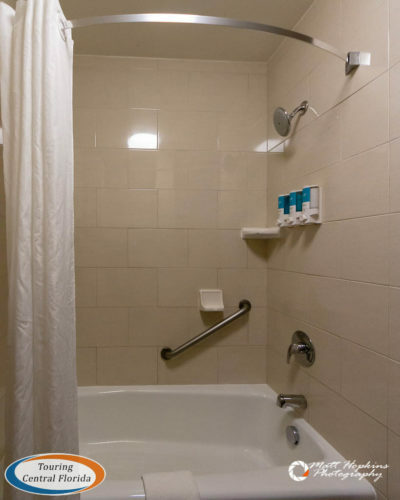 The bathroom was spacious and bright. Water pressure in the shower was great, and we had no lack of hot water either in the morning or evening. 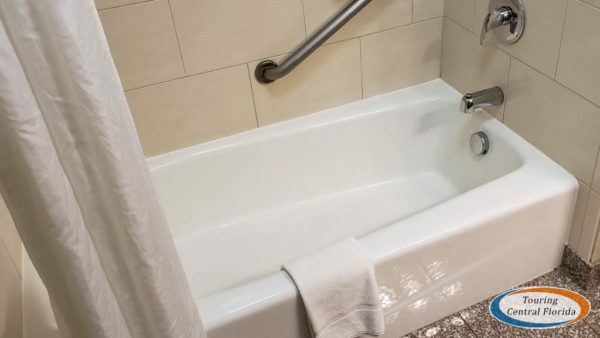 The tub wall was fairly low, so while it might be adequate for a child to take a bath in, an adult probably wouldn’t be able to enjoy a relaxing soak. 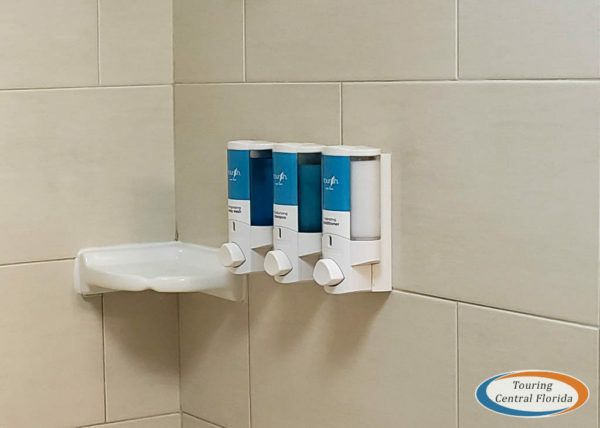 Like many hotels, instead of several small single use bottles of soap and shampoo, a dispenser is available on the shower wall with shampoo, conditioner and body wash.
Downstairs, the lobby was clean and inviting, with a small seating area and television opposite the front desk. There was also a Universal Orlando ticket counter staffed by a third party company during the day. We didn’t indulge, but fresh popcorn and fountain sodas are available most of the day at no charge. 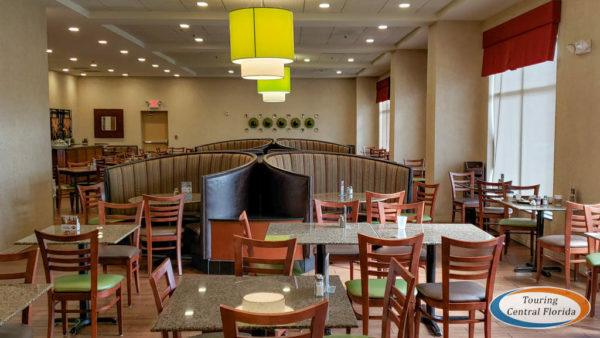 They also have a complimentary “Kickback” event each evening with complimentary alcoholic beverages and appetizer/snack items. We were out at the parks both evenings so didn’t get to enjoy this either, but someone using the hotel while visiting the area for business or a convention could certainly make use of this amenity. 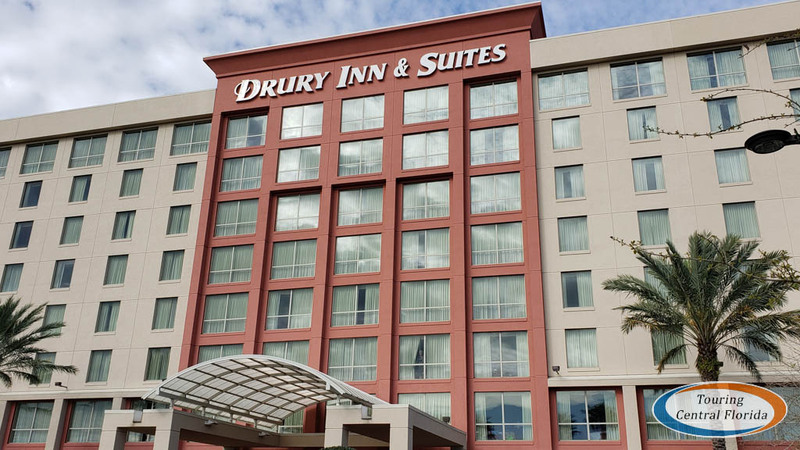 Drury Inn & Suites Orlando also has an indoor/outdoor pool & whirlpool, business center, and pantry, though we didn’t use any of those amenities. 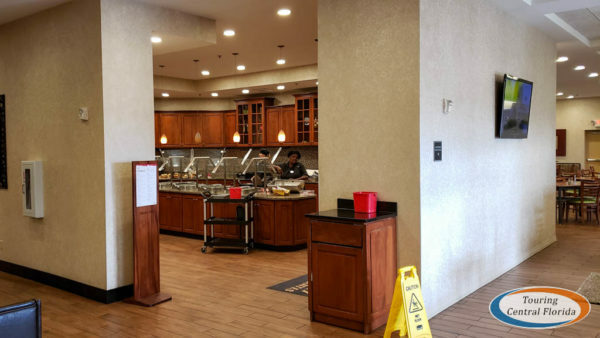 Both mornings we did stop by the expansive dining area for breakfast, which included a variety of hot and cold items. There were cereals, yogurt, fruit, scrambled eggs, breakfast potatoes, sausage patties, biscuits & gravy, and a make-you-own waffle station. Beverages included coffee, milk, fountain beverages and orange juice, although on the second morning the orange juice seemed to have run out in the last hour of service. The food was fine – certainly not restaurant quality, but filling and plentiful. With the dining area being quite large, we didn’t have to fight for a table either morning, despite it being fairly busy. The breakfast potatoes had quite the spicy kick, so be warned if you’re not looking for that sort of wake up call. 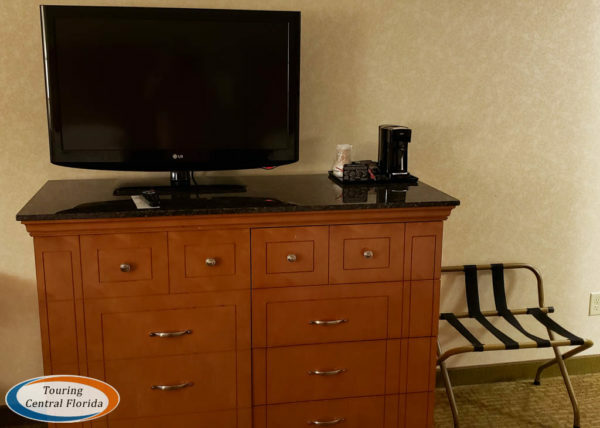 Overall, we were pleased with our stay at the Drury Inn & Suites Orlando. The location is fairly convenient being just off I-4, though be prepared for heavy traffic during busier periods. It’s just a short drive from both Universal and SeaWorld Orlando, though we spent most of our time at Disney parks on this trip and didn’t find the drive to be excessive. 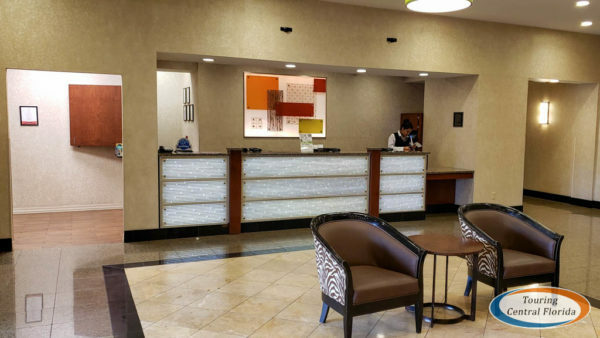 The front desk and breakfast staff were all pleasant, the room was clean and comfortable, and we would return especially if we could book at the great rate we were able to get on this trip.